This is a Klamath Indian game obtained for me by Mr. John L. Cox, at Hampton, Virginia, from Emma Jackson of Oregon. 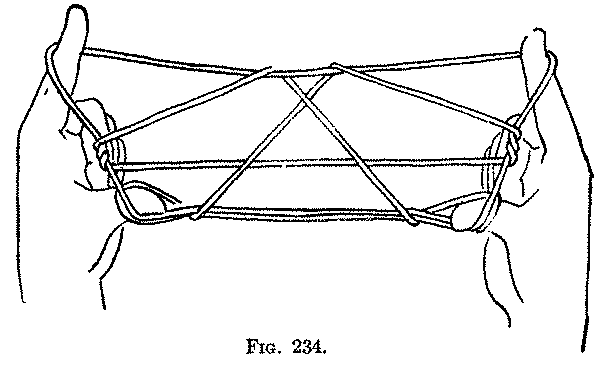 Second: Transfer the little finger loops to the index fingers, by putting each index from above down into the little finger loop, and picking up, from below (Fig. 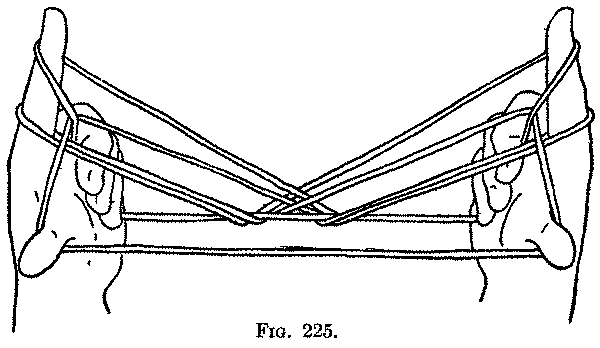 218), the far little finger string, and withdrawing the little finger. You now have two loops on each index and a loop on each thumb (Fig. 219). 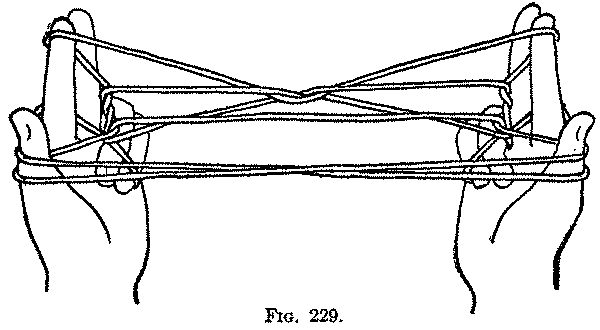 Third: Pass the middle, ring and little fingers of each hand toward you over both strings of the lower index loop, and pull them down by closing these fingers on the palm (Fig. 220). Fourth: Pass each middle finger from below into the thumb loop (Fig. 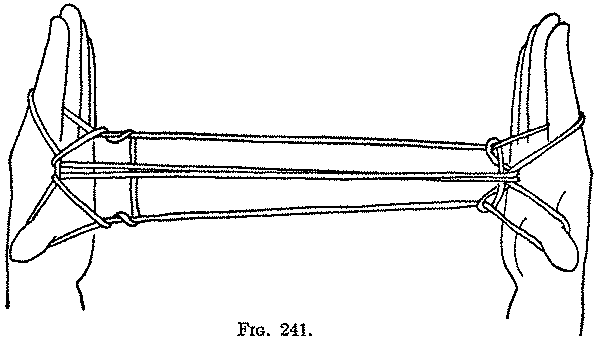 221); straighten the finger, put it from below into the upper index loop (Fig. 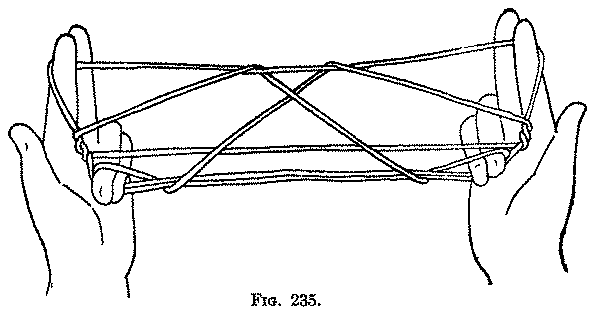 222) and pull down on the ball of the iinger the upper near index string, and draw it through the thumb loop (Fig. 223), then away from you past the lower index loop (held to the palm by the ring and little fingers). 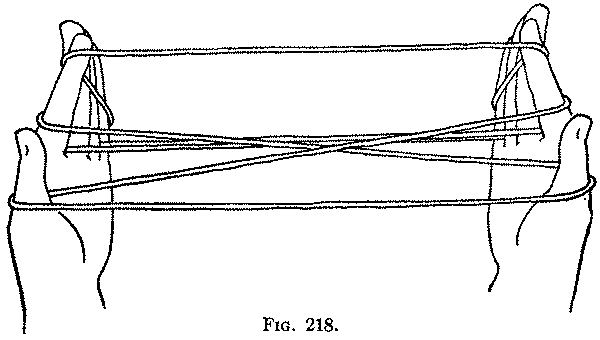 Release the loops from the ring and little fingers (Fig. 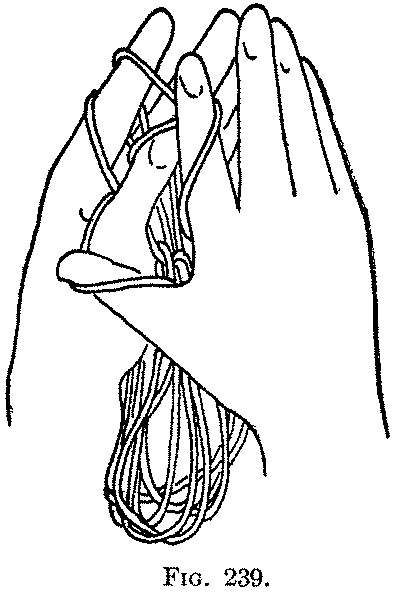 224), and insert these fingers into the middle finger loop beside the middle finger (Fig. 225). Fifth: Withdraw the middle finger, and pass it toward you through the upper index loop and under the near thumb string; then, keeping the strings tight, bend the index down on the near thumb string (Fig. 226), and draw this string away from you (holding it between the index and middle fingers) through the index loop, and put it on the tip of the index by turning the palm away from you. 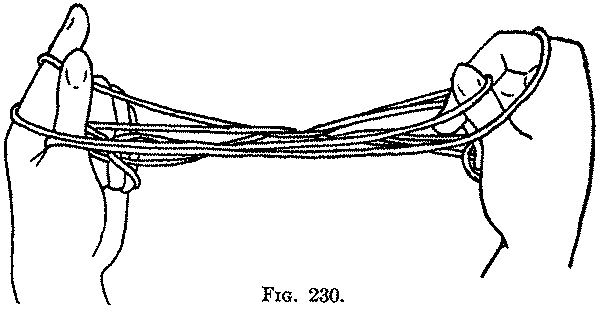 Release the loops from the thumbs (Fig. 227). 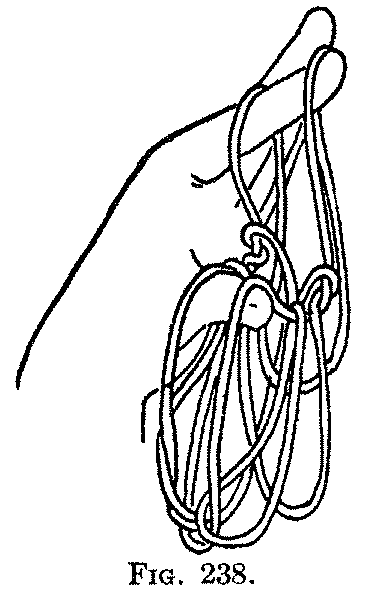 Sixth: Pick up with the back of both thumbs (held close to ether) the two lower index strings just where they cross at the bottom of the figure (Fig. 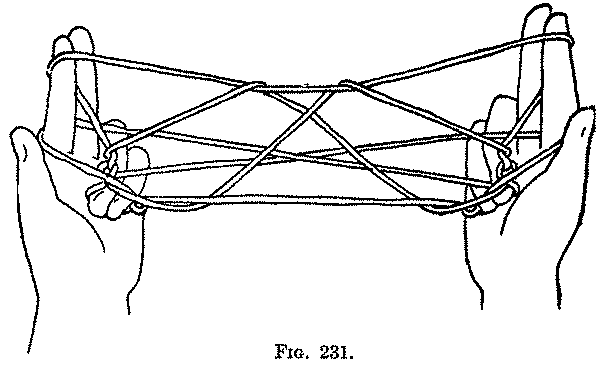 228) and draw these strings out by separating the hands. You now have two straight near thumb strings (Fig. 229). 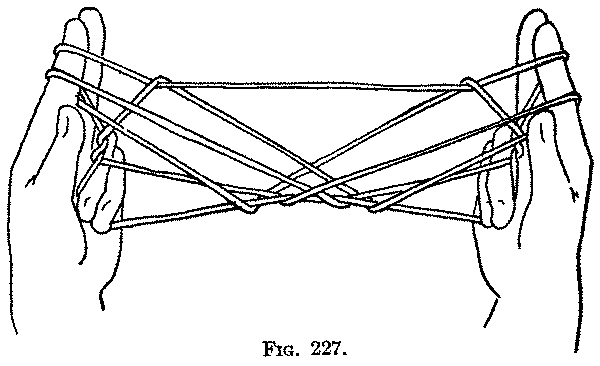 Seventh: Put each thumb against the index, to hold in place the upper near index string (Fig. 230), and then throw the two near thumb strings over the tip of the index, and let them fall on the far side. 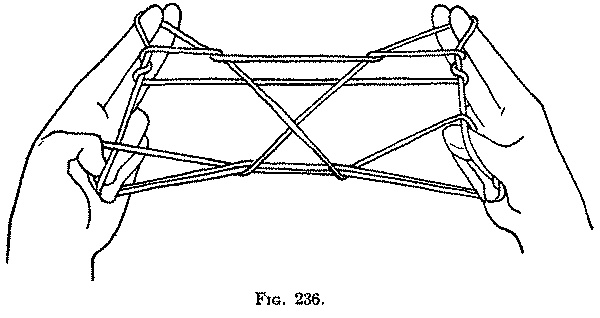 Separate the hands (Fig. 231). 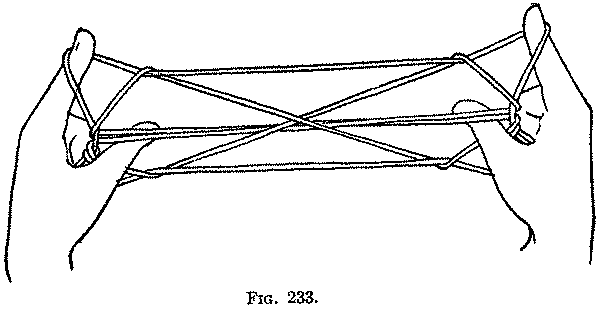 Eighth: Transfer the upper index loop to the thumb, by putting the thumb from below into it, and withdrawing the index from both its lamps (Fig. 232). 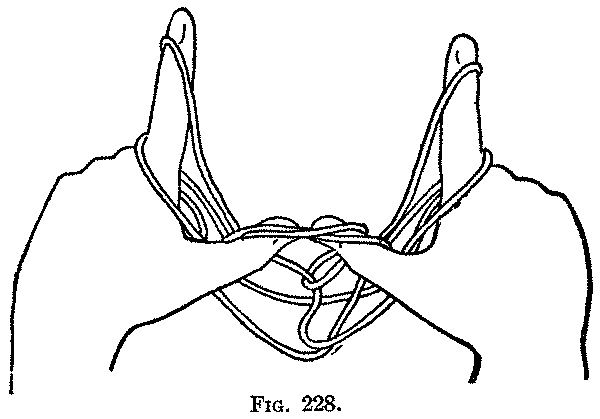 Ninth: Put the index toward you, that is from above, into the thumb loop and take the loop off the thumb. 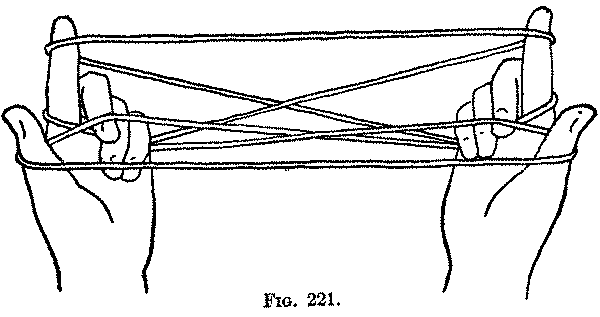 Tenth: Pass each thumb away from you through the corresponding side lozenge below the two straight transverse strings, pick these strings up on the back of the thumb (Fig. 233) and return the thumb to its position. 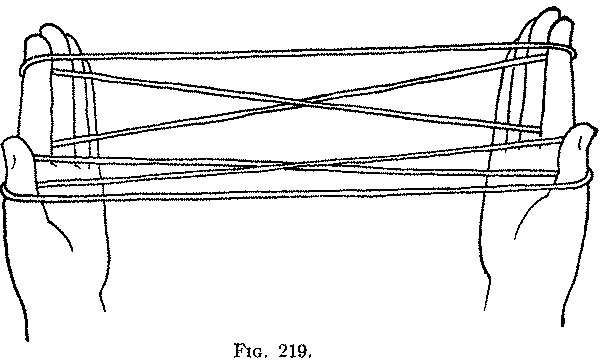 Release the loops held down by the ring and little fingers and draw the strings tight (Fig. 234). 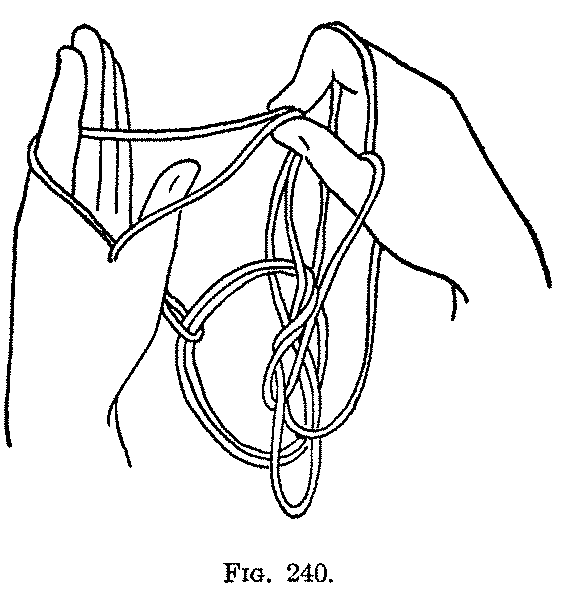 Eleventh: Pass the ring and little fingers toward you (from below) into the two thumb loops and bending the fingers over the two near strings, draw the loops down on the palm and withdraw the thumb (Fig. 235). 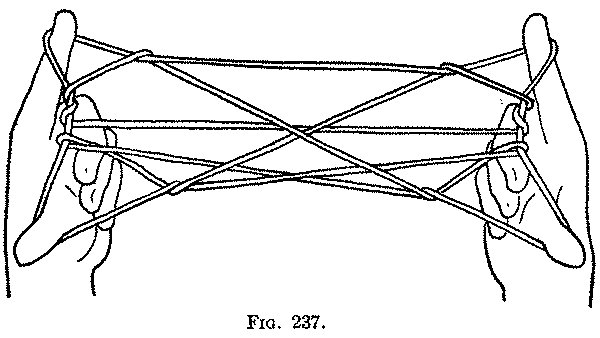 Twelfth: Put each thumb away from you into the loops held to the palm by the ring and middle fingers, and, drawing the single upper string of these loops toward the palm (Fig. 236, Left hand) with the back of the thumb pick up from the palmar side, the string which runs down from the index to the little finger (Fig. 236, Right hand). Withdraw the ring and little fingers (Fig. 237). Thirteenth: Bring the hands close together with the index finger and thumb of the one hand pointing toward the index finger and thumb of the other hand; then hang the right index loop on the left index and the right thumb loop on the left thumb (Fig. 238). Take up with the right index from the right side the loop which you have just put on the left thumb, and take up with the right thumb, from the left side, the loop which was originally on the left thumb (Fig. 239); then with the right thumb and index lift both loops from the left index, and put the left index toward you into the loop just hung on the left index, and put the left thumb away from you into the loop originally on the left thumb (Fig. 240). Extend the figure on the thumbs and index fingers (Fig. 241). The "rattlesnake" is at the left side of the figure, the "boy" at the right side. 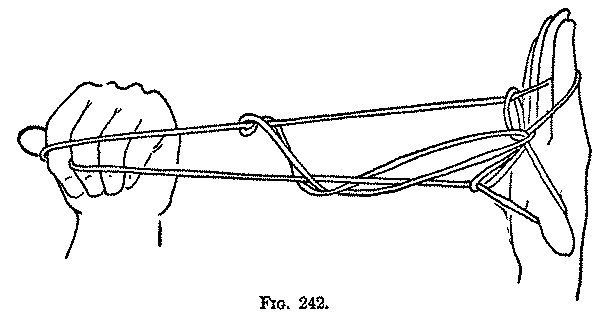 The snake can be made to run up and "bite the boy" by releasing the loop from the left thumb and pulling on the left index loop, at the same time quickly and alternately separating and bringing together the right thumb and index (Fig. 242). This game is the first of a series of four closely related Klamath games. The Second and Seventh movements are peculiar to these figures, that is, as far as now known; as we discover more figures they will probably occur again. The Thirteenth movement is very much like a movement in the Navaho "Butterfly."